Oh the long awaited last day of school is finally here! What will we find? Children, bounding out of bed, ready to greet the day? 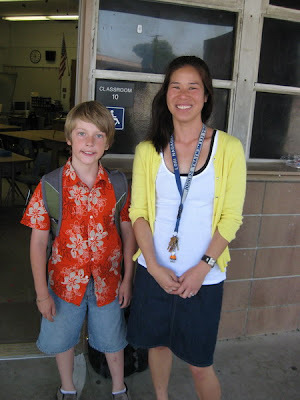 Here is Nathan, a final photo with his very patient teacher, Ms. Nagaoka. She will be teaching 4th grade next year. 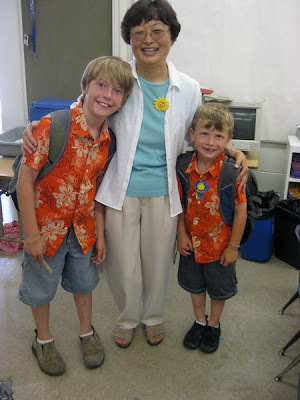 Here are both boys with Mrs. Kajikawa, who they both had for Kindergarten. It was announced today that she is retiring after 24 years of teaching, 15 years at this school. She made Nathan bend over for the photo because he is nearly as tall as she is! We walked home, and again they were just miserable, dragging their feet and moping. Not at all how you would expect a kid to be on the last day of school when summer vacation has arrived! I had to take a photo similar to one on the first day of school, only there were no smiles to be found. 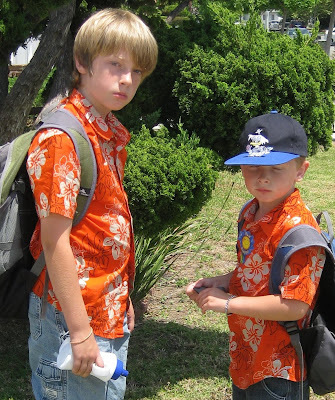 Yes, I made them wear the same shirts they wore in September (thanks again Mom!). 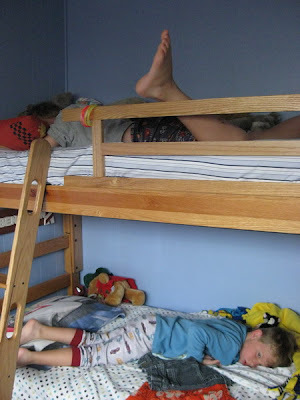 Hmmm, what to do when your children are NOT giddy with excitement and joy when school has finally ended for the year? Oh! I know! 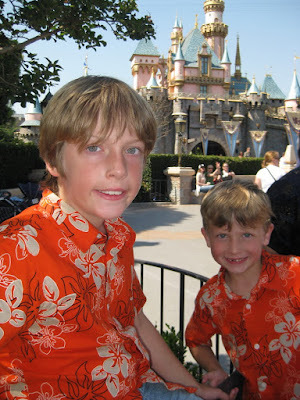 Let's go to Disneyland! Much, much better all around! Three cheers for Summer Vacation!